Is this simple puzzler worth your money? As anyone with a iPhone, iPad or any other smart phone can attest, taking cute critters and slamming them into solid objects has proven to be a winning combination...in the mobile space. But does it work for a console game? 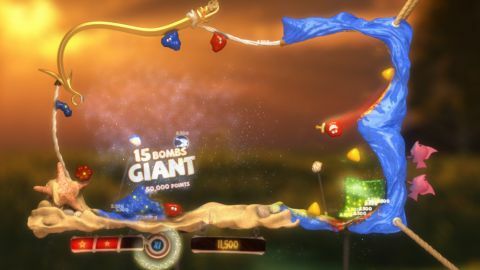 The Splatters aims to find out, with its physics-based puzzle action in which colorful (and suicidal) semi-solids blow themselves up in the most fantastic ways possible to net the highest stage score and hopefully earn a place on the leaderboards. The goal of each stage is to break the Splatters’ liquid core over every goo-encased glowing bomb scattered across the level. We generally didn't find this to be much of a challenge, since we were given more than enough of the smiling sacks of sludge to complete each stage. The real difficulty comes in racking up enough points to score a three-star rating. Performing stunts (and triggering stunt multipliers) is the primary method for nabbing more points. The Splatters start each stage sticking to floors, walls, and ceilings; we then fling the Splatters toward spikes and anything solid to break open their gooey innards. Stunt multipliers are awarded when Splatters use their abilities to change trajectory in mid-air, flip the momentum of the physics, slide over slick surfaces, or burst on a bed of spikes. If the resulting explosion causes the Splatter’s liquid to rain on a bomb, the multiplier gets added to the score. But while combining stunts to generate massive multipliers is fun enough in short doses, the actual puzzle elements are lacking. First off, the stages don’t have much variety; each level follows the same themes as the last, both visually and mechanically. The bomb placement would sometimes be the only change between levels – and even with that modest change, we had to use the same basic strategy to complete the stage. In other words, we basically repeated what was only a handful of stages throughout the game's three modes – and the lack of interesting layouts and challenging settings dulled the entire experience. The numbing repetitiveness wasn't helped by the Combo Nation mode, which felt less like a puzzle and more like an exercise in trial and error. Most of the time, we just haphazardly flung Splatters around, performed a few stunts, splattered on walls, and hoped our slime fell on the bombs below. If that didn’t do the job we just switched to the next splatter and tried again. Typically, as long as we kept our splatters moving and didn’t allow our combo meter to wind down, we received a good score. We never felt particularly skilled or rewarded when we achieved a high score. At best, Combo Nation is a playground to toy with the physics and test out combo shots, but is too open-ended and inconsequential to enjoy for extended play. On the other hand, the Master Shots mode felt like a legitimate puzzler, where we were challenged to plan out and accurately execute complicated stunt combos. Here, the player is limited to a single Splatter and the levels require designated stunts to be used to destroy carefully positioned bombs. These limitations made each stage feel different and complex, forcing us to analyze the layout and visualize a solution. It was a nice change of pace from Combo Nation’s lack of finesse, and we enjoyed a well-earned a sense of accomplishment with every completed stage. The Splatters provides a decent distraction for a few hours, but the $10 (800 MS points) price tag is a bit steep for a fairly simple puzzler. Aside from Master Shots mode, some neat physics, and the fact that you're playing with goo, the rest of the game gets dragged down by the lack of variety and overly straightforward gameplay. Or, to answer our opening question: What might work well on a phone becomes boring far too quickly on a console.